In 2015, I removed the legs from an old wooden ironing board, painted it with chalk paint and hung it on the door between my laundry room and kitchen. 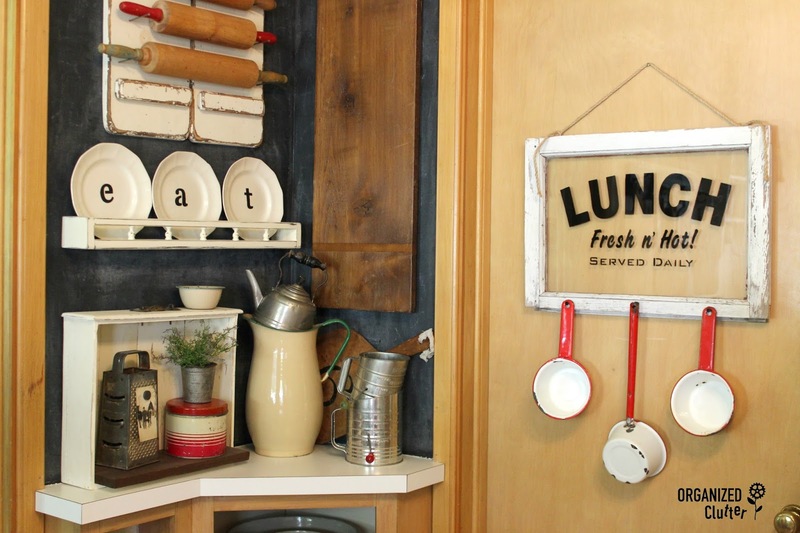 But after I made this fun lunch sign with a stencil from Old Sign Stencils, and hung it on the door, I needed to find another use for my ironing board top. Here's what I came up with! A coat hook for my craft room/den/guest room. First I re-painted the ironing board with Annie Sloan Chalk Paint in French Linen. 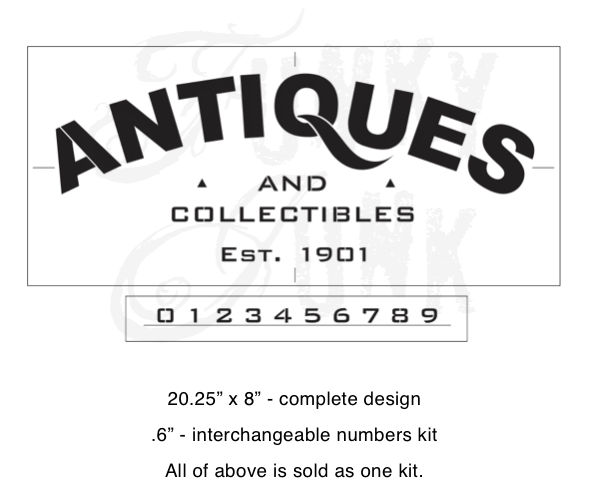 Next, I pounced on the "Antiques and Collectibles" stencil from Old Sign Stencils with black craft paint. 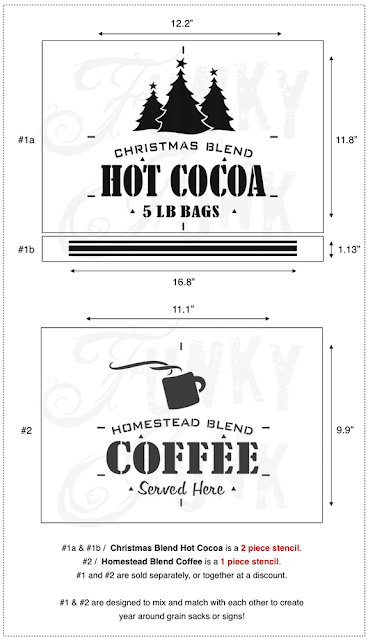 Then I used the grain sack stripe stencil from *Old Sign Stencils Hot Cocoa Group to add red stripes. Next I grabbed my new go-to distressing tool, the Plaid Layering Block. I use a sponge brush to add Ceramcoat Walnut Noyer craft paint to the block in a thin coat, and then I simply glide the block along the edges of my project. It really looks like distressing. After I had my edges faux distressed, I wanted a little more all over distressing. So I rubbed off most of the paint on my block on a newspaper, and then rubbed it over the center areas of my ironing board. The technique worked. Remember, if you screw up with the layering block, you just touch your piece up with your base coat paint. I had VERY little paint left on my block after rubbing it on the newspaper. After I sealed my project with Varathane Crystal Clear Matte Finish water based poly, I added 4 iron hooks purchased at Hobby Lobby. Hobby Lobby runs specials on hooks all the time, and you can usually get them for half price. This project is perfect for the guest room portion of my room. More room updates coming soon! What a great way to use an old ironing board top. 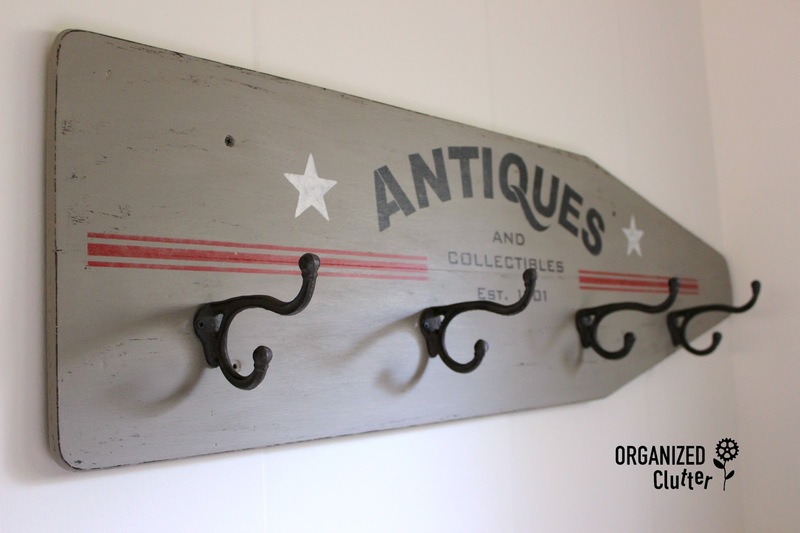 Makes a great coat rack, and turned out really nice! Love the stenciling and the distressing! Oh Carlene... this is so adorable! I love your choice of colours and design so much! Beautifully done! I love the ironing board, just picked one up at an auction on Wednesday. And I am very intrigued with that distressing block, I have never seen one of those before. Been trying to craft a layering block and using it with some used motor oil instead of paint. You should try this aging method see if you like it. I love your art! Love, love what you did with the ironing board! Now I wish I hadn't let a vintage one slip through my fingers last year. Very creative! I bought an old wooden ironing board at a thrift store recently and didn't have a clue what I would do with it. I just knew I liked it. But what you have done with yours is a great idea that I may just have to copy! Thanks for the post! I love your ironing board sign, Carlene, and the the layering block is a fun tool...thanks for sharing it with us! I am back! 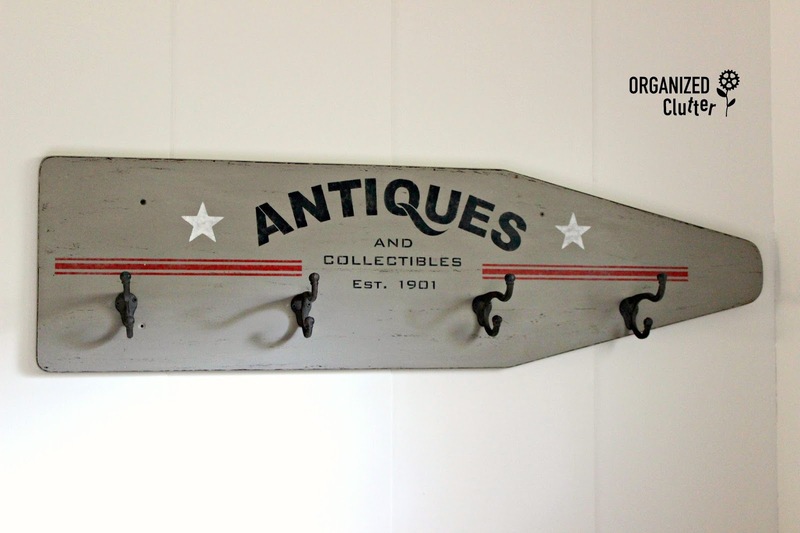 I've featured your ironing board in this upcoming DIY Salvaged Junk Projects. Thanks for making this beauty!